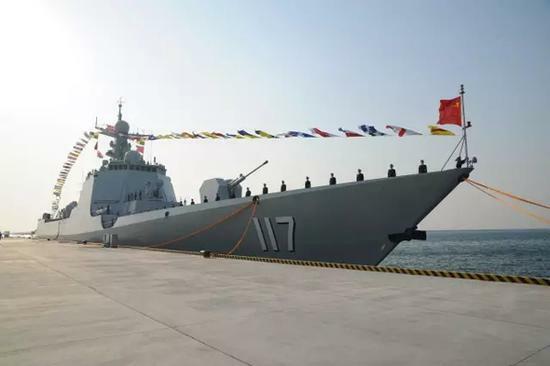 BEIJING, Feb. 7 (ChinaMil) -- The guided-missile destroyer Xining (Hull 117) was officially commissioned into the PLA Navy before the Chinese Spring Festival in 2017. While, Taiwan media has paid special attention to the fact that navies across the Strait both have a main warship named Xining. They claimed that the "Xining warships across the Strait will inevitably encounter at sea". Taiwan's Liberty Times reported February 6 that a naming and commissioning ceremony was held for a 7,000-ton-class type-052D guided-missile destroyer of the PLA before the Chinese Spring Festival in 2017. The new vessel, which is named "Xining", has a same name with the La Fayette class warship Xining currently serving in Taiwan's navy. According to an official in the Taiwan military, Taiwan's Xining ship belongs to the 124 Fleet with its home port in Zuoying. The PLA's Xining belongs to the North China Sea Fleet, but according to PLA's exercise and training model in recent years, main vessels in the PLA's three major fleets should all carry out cross-sea-area and far-sea combat training, so it's possible that the two Xining warships across the Strait will encounter at sea in the future. 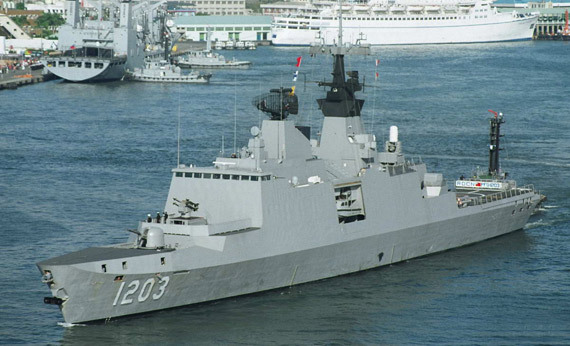 The La Fayette class vessel of the Taiwan navy is also called Kangding class. Taiwan bought 16 of them from France in 1991. The six vessels in the first batch were built in France in early 1992, but the other ten were no longer built due to the high price and other reasons. The Kangding class vessel features good stealth performance, large tonnage and advanced electronic reconnaissance, but its equipped weapons are limited, some of which have poor performance, and it is weak in air defense, and pilots even have to "scream for communication". This takes a toll on the vessel's overall combat capability. In contrast, the recently commissioned Xining warship is the latest guided-missile destroyer of the PLA Navy. Integrating multiple new-type weapons and equipment and boasting a high level of IT application, good stealth performance and strong electromagnetic compatibility, it mainly undertakes such missions as taskforce command, regional air defense, anti-submarine and sea combat. It is learnt that Taiwan's military vessels and ships are usually named as follows: first-class vessels (main battle vessels) are named after the local areas or famous generals in history, patrol ships are named after mountains, and third-class vessels are named after rivers. According to the Rules on Denomination of PLA Naval Vessels, the denomination of the PLA Navy's warships follows the rules below: cruise ships are named after administrative provinces (districts) or specific words, destroyers and frigates are named after large and medium-sized cities, nuclear submarines are named Changzheng (Long March) plus a number, submarine chasers are named after counties, dock landing ships and tank landing ships are named after mountains, infantry landing ships are named after rivers, and replenishment ships are named after lakes. Actually this isn't the first time that naval vessels across the Strait have the same name. Kunming, the first type 052D guided-missile destroyer commissioned by the PLA Navy in 2014, also had the same name as the La Fayette class vessel Kunming of the Taiwan navy. Some netizen commented that this reflects the "amity across the Strait", but what bothers the Taiwan media isn't the name sharing, but a sense of insecurity. In mid-January, 2017, the PLA Navy's first aircraft carrier formation headed by Liaoning crossed the Taiwan Strait on its way back from the Tsushima Strait, throwing the whole Taiwan into a collective panic.